Since China signed a free trade agreement (FTA) with Chile in 2005 bilateral trade has increased substantially, but there are still challenges. Both countries are expected to discuss these trade and investment concerns at the upcoming Asia-Pacific Economic Cooperation (APEC) Economic Leaders' Meeting in Lima, Peru on Saturday and Sunday. 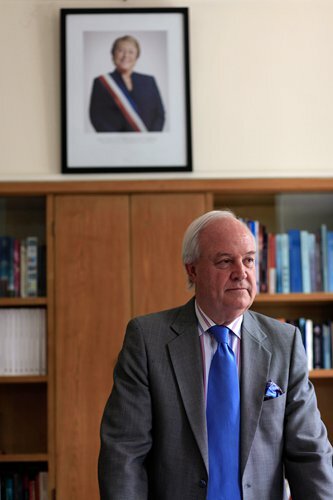 Global Times (GT) reporter Wang Wei talked to Jorge Heine (H), Chilean Ambassador to China, about these issues during an exclusive interview in early November. GT: What positive effects can we expect the APEC summit to have on the regional economy? H: Latin American economies are undergoing some difficulties these days. After the boom that took place in the last decade, the turbulence in the world economy has brought new challenges and some countries are facing negative growth. Thus, the APEC summit is a great opportunity to address those issues. The key issue is to give new impetus to international trade. For Latin America, and particularly for the trading nations of Latin America, in which Chile has a leading role, this is a key challenge. APEC should send a strong message about the need to rekindle the flow of Trans-Pacific trade and investment, and thus allow the region to get back on track. GT: Voices are emerging from around the world in opposition of free trade. How do you view this opposition and the effect an Asia-Pacific FTA would have on economic development? H: Strong anti-globalization forces have emerged, particularly in the north, in developed countries. This poses a danger to prosperity and growth in the world economy. In that sense, what can come out of the APEC summit is very significant. The most important item by far is to take a stand against protectionism and to say that, for the Asia-Pacific, the way forward to progress, to prosperity and to having a better quality of life is to further liberalize trade and lower the barriers for investment and trade flows across the world. On the specific question of the Asia-Pacific FTA, at the APEC summit a report will be delivered on its feasibility, and then it will be up to the member countries to decide whether to approve such a project and implement it. That is not going to be easy in the current climate because of the very forces you mentioned earlier, but it seems to me it should be the way forward. GT: Since China and Chile signed an FTA in 2005, what changes have we seen in terms of economic cooperation? H: The Chile-China FTA has been a great success. Bilateral trade has increased fourfold in these 10 years, from $8 billion in 2005, to $31 billion in 2015. So it is a great example of the benefits of free trade. A lot of people in Chile, were skeptical and said we would be overrun by Chinese products and that our products would have difficulty entering the Chinese market. That has not been the case. Both sides have increased their trade substantially. In terms of the way forward, this year we agreed to deepen the FTA, and to include areas not included in the previous version, which was for free trade in goods. Today we need much more free trade in services. So we're looking at including things like e-commerce, financial services, competition policy and government procurement. It's a very exciting time as we look forward to giving new impetus to the very dynamic China-Chile trade. GT: Despite the Sino-Chilean FTA, it seems the presence of Chinese firms in Chile remains limited. What are the reasons behind that? What should Chinese firms do to crack Chile's market? H: There is a discrepancy between the huge volume of trade that I mentioned and the relatively low Chinese investment in Chile. There are many reasons, and one of them is that in Chile, we have a market-driven economy, and do not sign government-to-government agreements for any given economic project as other Latin American countries do. And that has limited Chinese companies in having a greater presence because for Chinese companies, obviously, it's easier to be part of government-to-government agreements. But things are changing, and we are seeing more Chinese companies realize that in the fastest and more dynamic-growing economies in Latin America - Mexico, Peru, Columbia and Chile - the rule is that they have to participate in tenders to submit bids for projects. Say a hydroelectric plant has to be built, and the government opens the project for bids. The government won't sign a deal with any given company beforehand, but they must participate in the bid and say, this is what would cost and this is how the procedures go. Chinese companies, who are of course as good as any other, have realized that they can participate successfully in such tenders. We're particularly keen in having Chinese firms participate and invest in infrastructure projects such as tunnels, bridges, ports and airports in Chile, as well as in energy projects, especially in solar and wind. GT: Chile is a member of the Pacific Alliance, which has slashed tariffs on 92 percent of goods since 2014. What impact does the tariff cut have on China? H: The Pacific Alliance is a group made up of Chile, Columbia, Mexico and Peru. These are the most open and fastest-growing ones in Latin America and offer tremendous opportunities for Chinese companies and business. Despite difficulties Latin America is facing, the four countries are still having positive growth, attracting quite a bit of foreign investment, and they're very keen to do more business with China. GT: What is the biggest obstacle to achieving greater economic and trade cooperation between China and Latin American nations? H: Over the past 15 years, the relationship between China and Latin America has become extremely significant, and we have become so interlinked that this is something few people would have predicted 20 years ago. Trade between China and Latin America in 2000 was $10 billion, today it is $250 billion, a 2,500 percent increase in only 15 years. Distance continues to be a significant obstacle, although distance means a lot less today than it did 50 or 100 years ago. The world has shrunk. This distance has three dimensions, one of them is physical distance, the other two are, respectively, digital distance and cultural distance. Our aim is to reduce this distance as much as possible. It means making it easier for people to travel by reducing visa requirements; it means faster Internet connections by means of a project such as the proposed Trans-Pacific Internet fiber optic cable between China and Chile, which would be the first between China and South America. It also means cultural exchanges by having more students from Chile study in China and vice versa, and to know more about our respective artists and art works.